Smoking pheasant is a surprisingly delicious way to prepare this delicacy poultry. Since pheasant is such a seasonal dish that you may not make often, this recipe will give you the smoking tips you need to cook it right the first time. Since pheasant is a wild game bird, it will be more lean than other meat you are used to smoking. That is why we recommend using a brine to soak your chicken in a salty water mixture prior to putting it on your smoker to make sure your pheasant retains moisture during the long and slow smoking process. This will give you a succulent and smoky bird that you will not want to cook any other way. If you want to cook this recipe during a hunting trip and you don't have a smoker with you, simply make two V-shaped stands on both sides of your camp fire and hang your pheasant like a rotisserie about 2 1/2 feet directly over your fire. Next, soak wood chips in water for an hour to allow them to smolder and smoke instead of burn up quickly within the first few minutes of your smoking session. Another tip is to create 2 foil pouches with holes in the top to make your wood chips last longer. Place your 2nd foil pouch in the smoker about midway through the smoking process. You will want to light your charcoal smoker about 30 minutes before you want to start smoking your brined pheasants. You will know when the charcoal is ready when all of the coals turn to a glowing white hot color. During your 30 minutes while you are waiting for your charcoal, mix all of the smoked pheasant rub recipe ingredients together in a bowl. Fully coat your pheasants inside and outside with the rub seasoning. 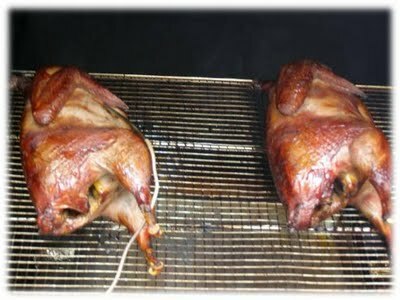 Place your seasoned pheasants on the smoker and adjust the smoker vent to about 3/4 the way open. If you are using a grill with an adjustable lid, make sure the vent is placed directly above your pheasant so the smoke is drawn across the center of the grill and your pheasants. Smoke the pheasant for about 3 to 3 1/2 hours to reach a temperature of 155 degrees. Wait 20-25 minutes before cutting into your smoked pheasant or you will not let the internal juices redistribute throughout the meat. This will make your pheasants more tough, so this is a very important step in this recipe. Smoking pheasants is faster than most other whole poultry like chicken or turkey because they are significantly smaller birds. You still need about 3 to 3 1/2 hours smoking time to complete this recipe. Your internal pheasant breast temperature should reach 155 degrees Fahrenheit and the juices should run clear.